A new study indicates that cocaine is now so prevalent in society that ten percent of those who have never even used the drug actually have traces of it on their hands. The study, which was carried out by researchers at the University Surrey, involved testing the fingerprints of 50 drug free volunteers and an additional 15 volunteers who had taken cocaine or heroin in the past 24 hours. The researchers found that of the fingerprints taken from the 50 drug-free volunteers, roughly 13 percent contained traces of cocaine, and one percent contained a metabolite of heroin. Dr. Bailey added that they have found a way to tell the difference between someone who had come into contact with environmental contaminants and someone who was a genuine drug user. “By establishing a threshold for significance on a fingerprint test, we can give those tested the piece-of-mind of knowing that whatever the result of the test may be, it was not affected by their everyday activities or shaking hands with someone that had taken drugs.” (Related: The TSA has been caught in a massive $100 million cocaine cover-up). This hypothetical scenario has happened in the past. Back in 2015, for instance, a bus driver in the U.K. by the name of Alan Bailes won a claim for unfair dismissal after failing a drug test because he handled banknotes that had traces of cocaine on them. While this was certainly an unfortunate occurrence, it really shouldn’t have come as a surprise to the people of Britain. 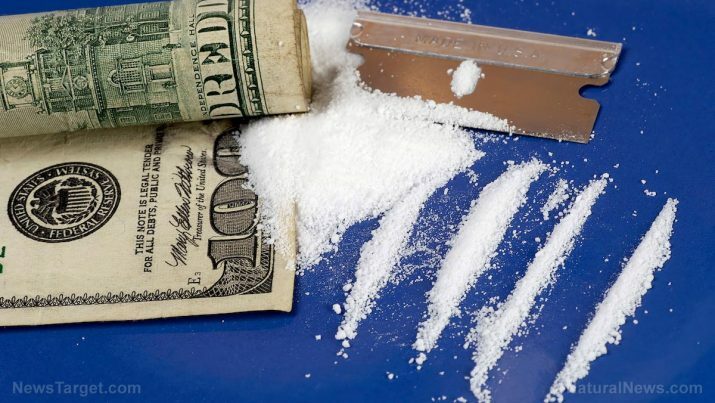 According to a study conducted by the Forensic Science Service, nearly all banknotes in the country are contaminated with cocaine within two weeks of entering circulation. Notably, the old cotton banknotes are notorious for picking up substances, which is one of the main reasons why the Bank of England is phasing them out and replacing them with plastic notes. Even though this study was carried out in Britain, concerns over cocaine and illegal drug use remain high in the United States as well, especially as our border remains open and illegal immigrants continue to traffic drugs into the country from Mexico. In January, for example, ICE reported that a 46-year-old illegal alien from south of the border was sentenced to 12 years in federal prison for smuggling cocaine into the United States after having been deported once before. Another illegal immigrant, 37-year-old Giovanni Montijo-Dominguez, was also charged by criminal complaint with cocaine trafficking.